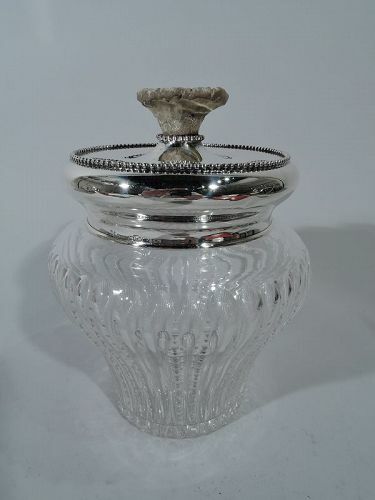 Edwardian cut-glass tobacco jar with sterling silver cover. Made by Redlich & Co. in New York. Jar ovoid with 3 plain flutes alternating with 1 notched flute and underside star. Cover has bellied sides and flat top with applied beading and centrally mounted antler finial. A great alpha antique. Hallmark includes no. 357. Very good condition.